This website collect all information professionals about: Vietnamese food, vietnamese food recipes, vietnamese food Culture, pho soup, beef, rice noodles, seafood ....It is very important and useful if you want to have a tour in vietnam. And that is not bad idea for your taste. Someone asked me the other day what my favorite food was..."Vietnamese!" I quickly replied, "At least for the moment." Vietnam is the easternmost country on the Indochina Peninsula in Southeast Asia. It is bordered by China to the north, Laos to the northwest, Cambodia to the southwest, and the South China Sea, referred to as East Sea (Vietnamese: Biển Đông), to the east. With a population of over 86 million, Vietnam is the 13th most populous country in the world. Hanoi now has several stores selling Cha ca La Vong, but none of them can be equal to the Cha Ca Road’s in terms of quality and flavor. As a popular dish, La Vong grilled fish pie is indeed a remarkable culinary invention. In ancient days, there was a street selling paints, called the Paints Street. The Doan family, located at house No, 14 of this street, hit upon a new idea that sold fried fish pie served with soft noodles and seasoning. Encouraged by the appreciation of customers, the family specialized in this trade and the shop was called as "Cha ca La Vong store" as a wooden statue of an old fisherman (La Vong) holding a fishing rod and a string of fish stands at the door. 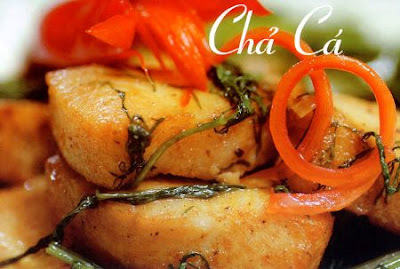 As the specialty grew famous with every passing day, the street was renamed by the people as Cha Ca Street (fried fish pie street). While you sit down at the table, the waiter starts laying there some seasonings includes a bowl of well - stirred shrimp paste sauce mixed up with lemon. After dropping the liquor, he will decorate the bowl with a few slices of red fresh pimento, a plate of grilled ground nuts of gold yellow color, various species of mint vegetables o­nions in small white slices. To many customers, the sight of such seasoning already greatly stimulates their appetite. A few minutes later, fried fish, yellow in color and flagrant in smell put o­n a plate of anethum vegetable, is brought in. But that is not all. A few seconds more, as soon as a cauldron of boiling fat is brought in, the waiter starts pouring it o­n each bowl of grilled fish, thus producing a white smoke and sputtering noise.